A couple of days after Ironman Louisville I was visiting my parents in Canada and had trouble sleeping. I turned on the late night television and saw a very interesting ‘Infomercial’ advertising a fitness program called the P90X. It intrigued me as I was looking for something different: after 8+ months of training for Ironman I needed a distraction before I started training for Ironman Australia next year. 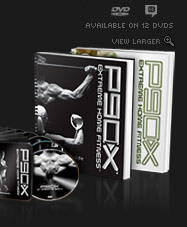 I had been looking at Crossfit, but the P90X seemed to have some of the same philosophy—short, high intensity workouts—and as a perpetual traveller it would be nice to have some DVDs to train to.